Want unli text that is good for 1 month? Well, you're in the right place, in the right post. 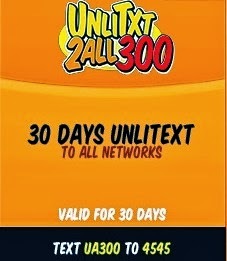 UA 300 will boost 30 days of unlimited text to all networks, may it be Globe, TM, SUN, SMART, RED, or Talk N Text itself just name it. Connect to all your friends using this exclusive promo of Talk N Text, get in-touch anywhere in the Philippines. UnliTXT2All300 if computed per day, will be Php10.00 per day for unli txt to all networks. I guess P10 is not much to be worried as a major expense. Enjoy unlimited text to all networks, text as much as you like, as many as you like. Some people might need to text frequently everyday, so this promo suits them best. Anyway its just a matter of personal preferences. "Sorry, svc cant be process due to # of users..."
is that true?? i will try that..
pana ba ma ecoconect yung internet sa UA 300? i dont know how to use the internet in this promo! how to use this promo actually right now i avail this promo but i dont know how to use this promo they give! pede paba to ngaun ? my promo po ba na unlimited text to all network for 1 month?